Kaibab Suspension Bridge – Phantom Ranch, AZ Quadrangle – amTopo by Apogee Mapping, Inc.
Perhaps the most popular hiking destination in America, Phantom Ranch – situated along the Bright Angel Trail and the Colorado River in Grand Canyon National Park –has a vast human history in addition to being located in one of the most awe-inspiring natural settings. The Kaibab Suspension Bridge, also called Black Bridge, is one of the more awe-inspiring man made features still present in the area. The spot known today as Phantom Ranch was first called “Rust’s Camp” around the turn of the 20th century, but had been settled by Native Americans well before then. 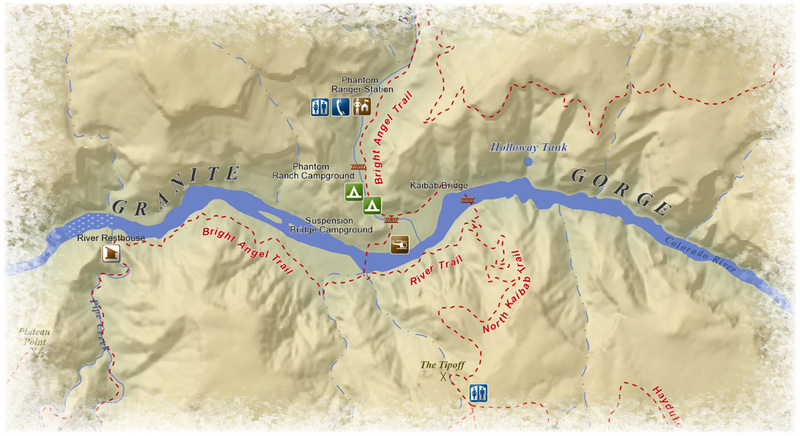 David Rust was the first to establish a tourist trail from the North Rim to the inner canyon along Bright Angel Creek, terminating at a tent camp. He was also the first to design a means by which visitors could cross the mighty Colorado River and continue up to the South Rim. His first engineering feat, completed in 1907, was the construction of a cable tram across the river. This tram could only accommodate a single mule or a few people at a time. As visitation to the inner gorge increased, a wooden suspension bridge soon replaced the precarious cable tram, but high winds would cause the narrow bridge to sway heavily, sometimes flipping over, making it an equally harrowing crossing. 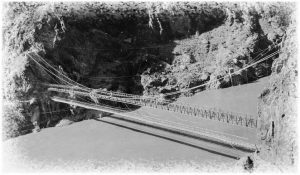 By 1928, the National Park Service decided it was necessary to construct the current steel cable suspension bridge. At the time, this was the only bridge to cross the Colorado River upstream of Needles, California – some 360 river miles to the south. Because no roads existed (then, or now), mules and men were needed to haul all of the construction materials down to the canyon floor. Each of the 1-ton, 550-foot steel cables was too heavy to be hauled by mules. Instead, they had to be uncoiled and stretched lengthwise atop the shoulders of 42 Havasupai Indians hiking single-file down nine miles of trail with a vertical descent of 4,000 feet. This feat was repeated eight times in order to get all of the cable moved. To this day, hikers are dazzled by the experience of emerging from the short, dark tunnels on either side of the bridge into the heart of the Grand Canyon with the Colorado River and its rafters rushing downstream, just 65 feet below. The ability of visitors to cross from rim to rim has allowed for unrivaled back country experiences and the Kaibab Bridge remains a true engineering feat in such an extreme environment.